We released the second episode of Archiving AK, in which archivists Gwen and Veronica interview researcher Pierce Bateman. Links to Archiving AK episodes can be found on the podcast page of our website. 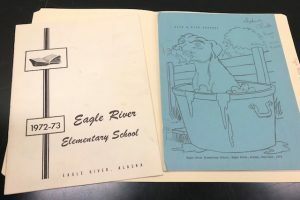 EPH-0395: Eagle River Elementary School yearbook and newsletter; 1972-1973. HMC-0932: Walter Johnson papers; 1902-2008, bulk 1961-1978. We received a 6.4 cubic foot addition to our already existing Walter Johnson papers. Johnson worked as a doctor at Bethel Hospital, served as the Chief of Medicine and then Medical Director at the Alaska Native Medical Center in Anchorage, and was a Director and Instructor for the Community Health Aide training program (also called Community Health Aide Program, or CHAP). The collection includes Johnson’s research on tuberculosis, files relating to the Community Health Aide Program (CHAP), and the founding and establishment of the Alaska Medical Library (formerly called Alaska Health Services Library). The collection also includes Johnson’s research on the discovery of gold in Nome, history of Swedish people in Alaska, the Sami and reindeer herding, and advocacy for bike paths in Anchorage. HMC-1281: Botens-Stoops family film; circa 1955-1978. This collection contains 8mm films created by members of the Botens and Stoops family. Subjects of the films, as indicated by family members, include camping at Skilak Lake, a canoe trip in 1966, the Botens’ homestead in Anchor Point, North Fork and Caribou Hills, a cabin at Summit Lake, Baltic Lake, a canoe trip on the Killey River, a meat house and chicken house, beaches, animals and scenery, hunting and fishing, Eklutna, Nome, Port Moller, and the North Slope. The films also depict community events in Soldotna, Anchor Point, and Homer. Access to this collection may be subject to delays and costs for the digitization of the originals. 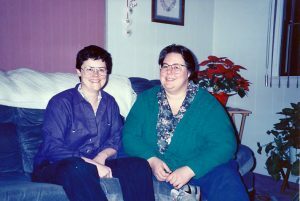 Cheryl Curtis and Morgan Grey. What was once our picturingUAA site will be taken down at the end of June. 297 of the over 600 images that were on it were added to Alaska’s Digital Archives. This task included modifying and adding metadata on each item. This work continues and we hope to have all the photographs moved over by the end of June. We also received news that Robert Knox, one of our collection donors, passed away. We digitized one photo of Bob, as well as his Alaska Press Club membership card from the Robert and Wilma Knox papers; 1949-2001. HMC-0461. These were added to the 330 photographs that we had previously digitized. 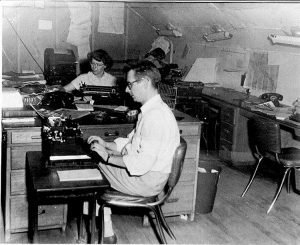 Bob Knox and Helen Gillette in the Anchorage Daily News newsroom in 1952. 22 images from the Henry Gilbertson papers, HMC-0115. Henry Gilbertson worked for the state of Alaska as an administrator for the state-operated schools in many areas of rural Alaska. His photographs, from the mid-1960s to the early 1970s, include images of many rural schools and schoolchildren. 60 images from McGlashan and Monsen family photographs, HMC-1278. Photographs primarily taken in Naknek and Akutan. More photographs of this collection will be added in the next few months. 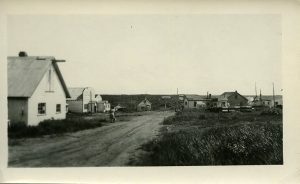 Caption on back of photograph: “Main Street Naknek [circa] 1946”. From McGlashan and Monsen family photographs. 32 images from the Al E. Beyer papers, HMC-0958. 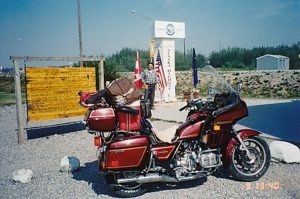 In the summer of 1994, he completed a motorcycle tour to Alaska covering over seven thousand road miles. Photographs from his trip were added to Alaska’s Digital Archives. Beyer and his motorcycle at the end of the Alaska Highway in Delta Junction. 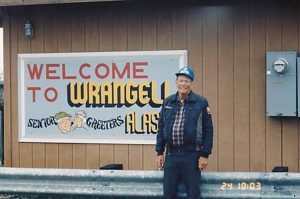 Al Beyer in front of the Welcome to Wrangell sign. 75 images from the Francis Huber slides, HMC-1280. Huber was an avid photographer whose photographs were published in magazines and textbooks. Most of Huber’s photographs recently added to the Digital Archives were of wildlife. Additional photographs from this collection will be added within the next couple of months. 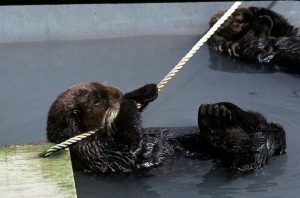 Sea otter recovering from the Exxon Valdez Oil Spill, 1989. HMC-0439: Gary Thurlow papers; 1930-1995. Thurlow was an attorney for the Greater Anchorage Area Borough, manager for the Matanuska-Susitna Borough, and a lawyer in private practice. His collection primarily contains drafts of articles on urban and governmental planning. HMC-0793: United States. Air Force. 11th Fighter Squadron photographs; 1945. The Eleventh Fighter Squadron, a unit in the Eleventh Air Force, was assigned to the XIth Fighter Command in June 1942. From September 1942 to August 1946, the squadron was assigned to the 343rd Fighter Group. The squadron was first stationed in Alaska at Elmendorf Field in December 1941, with detachments at Fort Randall and Fort Glenn. The squadron was later stationed at Adak Army Air Field in February 1943, with detachments at Amchitka and Fort Glenn. Finally, the squadron was stationed at Shemya from August 1945 to August 1946. The collection contains images of the fighter squadron. UAA-0044: Anchorage Community College. ACCent photographs; 1982-1988. Photos from the ACC student newspaper. UAA-0047: Anchorage Community College administrative subject files; 1953-1978. Historical files related to Anchorage Community College. The post New in the Archives: May 2018 appeared first on Archives and Special Collections. The post Archiving AK Episode 1: Introduction to us appeared first on Archives and Special Collections.